Alex Bilokur turned into a poker freight train here at Event #28: $10,000 Pot-Limit Hold'em, completely dominating heads-up play as he turned a nine-to-one chip deficit into $398,567 and his first World Series of Poker gold bracelet. Bilokur already sported a solid poker resume with nearly $3 million in tournament cashes, including taking down a PCA High Roller event in 2012. 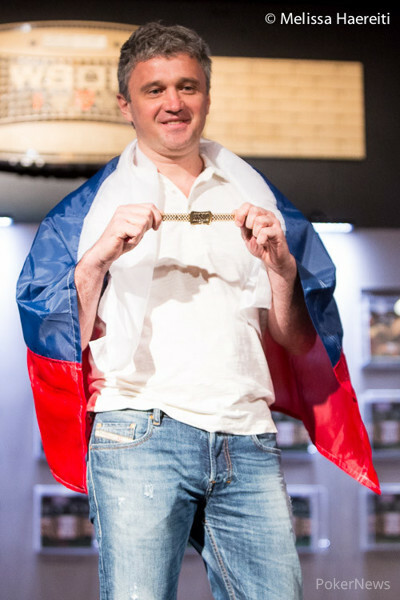 Now, the Russian has added the pinnacle of poker tournament accomplishments to that list of successes. We began the day with 10 players, quickly saying goodbye to Dan Shak after he ran his aces into Chino Rheem's set. Rheem held the chip lead as the official final table began. We saw short stacks Barny Boatman and Richard Lyndaker bow out soon afterward, and Pratyush Buddiga got set over set by Ismael Bojang to bust in seventh. Todd Brunson then exited in sixth when he couldn't improve an open-ended straight draw and overcards against a smaller pair. 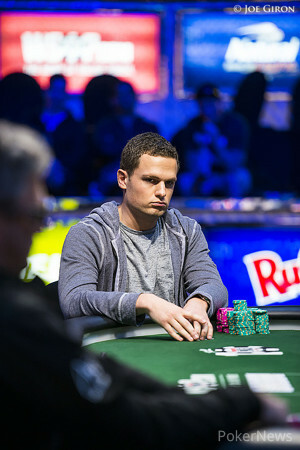 Rheem was unable to hang onto his chip lead, bleeding off chips until busting in fourth just after Ismael Bojang took fifth. Rheem flopped top two but sent his stack over to the bottom set of Matt O'Donnell on a flop. It looked like that was going to be the pot of the tournament, as O'Donnell had his last two opponents covered multiple times over. When O'Donnell ousted Alexander Venovski in third, it looked like heads-up play was a mere formality as O'Donnell had just over 4.3 million to Bilokur's just under 500,000. However, Bilokur completely took over the match with a small-ball style, continually limping buttons and inducing aggression from O'Donnell when Bilokur held superior hands. After just over 100 hands, he'd claimed the championship. Thanks for tuning in to PokerNews' coverage of another championship event here at the 2014 WSOP. 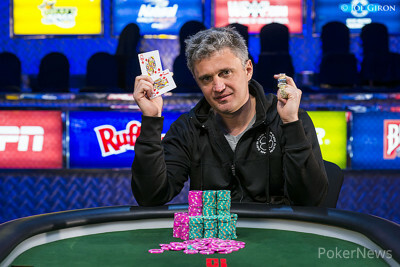 Alex Bilokur overcame a massive chip deficit heads up to defeat Matt O'Donnell and capture a 2014 WSOP Gold Bracelet. Hand #206: Matt O'Donnell made it 180,000 and Alex Bilokur called. The flop came and after a Bilokur check, O'Donnell pushed in with . Bilokur made the call with and after the turn, the river made Bilokur a flush and the winner of the $10,000 Pot Limit Hold'em Championship. O'Donnell was forced to settle for second and $246,310. Hand #203: Alex Bilokur called and Matt O'Donnell raised to 150,000. Bilokur called and the flop fell . They checked to the turn and the river. Bilokur showed ace-high and it was good. Hand #204: Matt O'Donnell gave Alex Bilokur a walk. Hand #205: Alex Bilokur called and Matt O'Donnell raised it up to 180,000. Bilokur folded. Hand #196: Matt O'Donnell raised to 120,000, and Alex Bilokur called. O'Donnell bet 80,000 on the flop and got called. A fell on the turn, and O'Donnell bet 250,000. Bilokur quickly called, and a completed the board. Bilokur check-called 450,000, and O'Donnell had for ten-high. Bilokur had and took the pot with his two pair. Hand #197: O'Donnell raised to 150,000 after Bilokur limped, and O'Donnell won. Hand #198: O'Donnell raised on the button and won. Hand #199: The two saw a flop for the minimum, and Bilokur won the pot with a bet. Hand #200: Bilokur got a walk. Hand #201: On a board of , Bilokur won the pot with a river bet. Hand #202: O'Donnell raised the button and got called. O'Donnell bet 250,000 on the board and Bilokur called. On the river, they both checked, and Bilokur had rivered trips with . Hand #190: Matt O'Donnell gave Alex Bilokur a walk. Hand #191: Alex Bilokur called and Matt O'Donnell checked. They checked the flop and on the turn Bilokur bet 75,000. O'Donnell raised to 225,00 and Bilokur called. The river came the . O'Donnell checked, Bilokur bet 275,000 and O'Donnell folded. Hand #192: Matt O'Donnell made it 125,000 and Alex Bilokur called. The flop came down and was checked. The turn was the . Bilokur bet 125,000 and O'Donnell raised to 450,000. Bilokur potted it and O'Donnell folded. Hand #193: Alex Bilokur called and Matt O'Donnell checked. The flop fell and was checked by both. The turn brought a 75,000 bet from Bilokur that was called. The on the river was checked down and won the pot for O'Donnell. Hand #194: Matt O'Donnell gives Alex Bilokur a walk. Hand #195: Alex Bilokur called and Matt O'Donnell raised, making it 150,000. Bilokur called, the flop was and they checked. The turn saw O'Donnell bet 225,000 and Bilokur fold. With that both players headed off on a 25-minute break. Hand #181: Alex Bilokur called, and Matt O'Donnell checked. Bilokur bet 100,000 on fourth street on a board of , and O'Donnell called. O'Donnell bet out 250,000 on the river, and Bilokur called. Both players held a deuce for a straight. Hand #182: O'Donnell raised to 100,000 and won. Hand #183: Bilokur limped and called 150,000 from O'Donnell. On the flop, O'Donnell's continuation-bet won. Hand #184: Bilokur got a walk. Hand #185: Bilokur limped, and O'Donnell checked. O'Donnell check-raised to 250,000 on the flop, and he took down the pot. Hand #186: The two saw a flop for the minimum, and O'Donnell bet 150,000 after Bilokur checked. Bilokur folded. Hand #187: The two saw an for the minimum, and Bilokur bet 75,000 and won. Hand #188: Bilokur got a walk.